Throughout the week we attend various organised groups and activities. One of the children’s favourite is Tots’ cise. It’s run by Kerry and Leanne at Great Oakley Village Hall Corby (see their poster above for more details). Kerry and Leanne set the group up when their own children were toddlers. Now their children are older and are all at school. I’ve been attending the Great Oakley session for four years now. I took my six year daughter for two years prior to her starting school and have continued to take the children that I look after. Sometimes in the school holidays they run sessions so that older siblings can join in too. The sessions always start with their welcome song, ‘Here we are at Tots’ cise with Kerry and Leanne…….’ The children then dance to selection of songs which are alternated weekly such as Peppa Pig, Driver Dan, Balamory, Fireman Sam. Tots’ cise have the songs written and recorded for the groups and CDs can be purchased. We often play the CD at home and the children have arguments about who will be Kerry and who will play the role of Leanne. The children know the routine, after they have playing with the parachute and balls it is time to ready for a snack. Leanne’s Mum is there to make the parents and carers a tea or coffee. She is fab and always has a black coffee waiting for me. It’s then time to calm down a little. The children are invited to choose their favourite nursery rhymes to sing with Kerry. The sessions ends with the Tots’cise very own goodbye song. I look after children of mixed ages so have always went to the Tots’cise sessions. 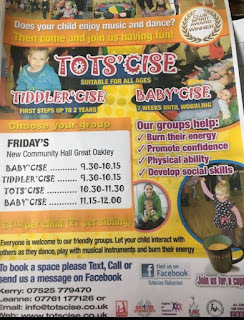 They do run specific classes for babies and toddlers. I’d highly recommend the sessions. They aren’t run for profit. All the proceeds from the classes go back into buying the many tambourines, ocean drums, pom poms, monkey drums, toy wands, shakers, fancy dress capes, etc.